Thanks a million! What a wonderful thing to share with others! Do you have this for second grade? Thank you! Thank you! Thank you! I just found these on Pinterest and they are AWESOME! WOW! Thank you for taking the time to not only create such wonderful documents, but for sharing as well…. These are awesome!! I shared them with my colleagues, too!! Thanks for sharing!!! This has been a huge help, thank you! I will be using them in my math and reading centers as checklists. These are FABULOUS! Thanks for sharing your hard work! What a brilliant idea! 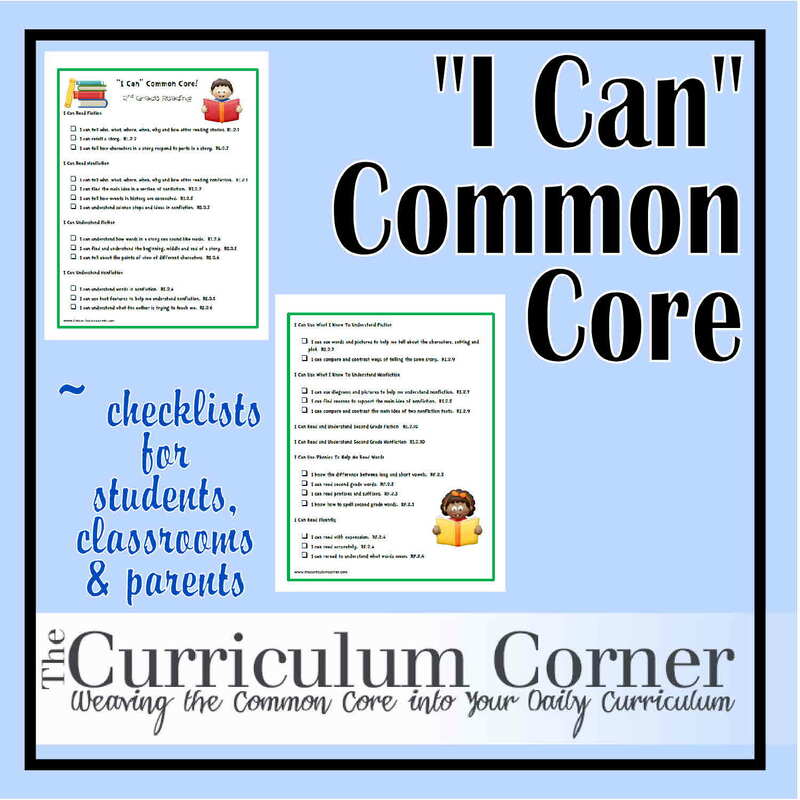 I’m using “I can” common core! to inform my students’ parents and I’m personally using them to guide my son and daughter in their strive to meet the common core standards. Thank you so much! Thank you. I appreciate the effort that went into making these. Does anyone know where I can buy sentence strips with kid friendly common core standards printed on them? Hi Allen! We don’t know where you could find these currently, but it’s a great idea. We’ll put it on our to-do list! I didn’t see any ‘I Can” statements relating to the addition and subtraction standards… are they missing or did I miss it? Hi Randy. The third grade common core math standard for addition and subtraction (3.NBT.2) is on the second page. Third grade common core operation standards focus mostly on multiplication and division. Addition and subtraction are mostly addressed in second grade. Thank you for these wonderful posters. I look forward to using them this year. These posters will be a big help for me this year. Thank you I was going to type them up my self. Do you have “I can” statements related to 3rd grade Common Core for the areas of science and social studies? Hi Amber! We don’t currently have checklists or “I Cans” for science or social studies, but we will be working on science soon. I love what you have created! Are these the California version of Common Core Standards? I know California added some items to the Common Core. Thanks for making these- VERY HELPFUL!! Hi Dinese! No, these were adapted from the list on http://www.corestandards.org which doesn’t incorporate any additional standards added by states. Thank you very much for sharing!! Do you know if they are translated in Spanish any where on the Internet? First grade should be posted by this weekend, Melissa, provided our translator gets them to us by tomorrow. She will be working on 2nd grade next and then move up through the grades. We hope to have them all available (1st – 6th) by January 1st. These are so helpful. We are in a K-8 school. I would love to see these for 7th and 8th graders, too. Are they available? Hi Mrs. Charmont! Thank you for your question. Unfortunately we don’t have current plans to create “I Cans” for 7th and 8th grade. So sorry! We simply don’t feel qualified at this point since we are both elementary teachers. Perhaps someday we can find someone who will do them for us and we can post those. Until then, I hope that our 7th and 8th grade checklists are helpful. Are third grade “I can” CC standards going to be transalted into Spanish? That would be immensely appreciated!! Thank you so much from a fellow teacher in Illinois. These are so AWESOME! This is great. I needed this, thank you for your hard work! Thank you for this resource! Do you have any idea when 3rd grd will be available in Spanish? Hi Delia! We are sorry those aren’t available yet! They are being created, but we are unsure of when they will be available. Please continue to check back with us! These checklists are great! I homeschool my daughter and these are a great way to see if we are keeping on track! Thank you! Thank You! This is a wonderful tool! Please let me know if you get learning targets for the NGSS standards. Hi Michelle! We have a lot on our plate right now, but hope to work on those this summer or fall. THANKS! I’m not sure if my first post didn’t work, or if it landed on a different page, so if I’m repeating myself, I apologize in advance. I LOVE the check Lists! THANK YOU! Will you be making any of the updated checklists with the darling clip art you used on the old ones? I would love to put these in their learning folders and the art work was very cute. Either way, will you share where you got the cute clip art? Thanks again, your work is very appreciated! Great job! Such a great help to a new third grade teacher. Thanks. HI! I just found you and I wanted to say thank you for helping me get organized- I truly appreciate the work you put into making these and they are wonderful!! Thank you so much!! Second year teacher and moving to third grade. I was pretty much clueless about the “I Can” statements last year in K. This is awesome!